Lights, effects, action! 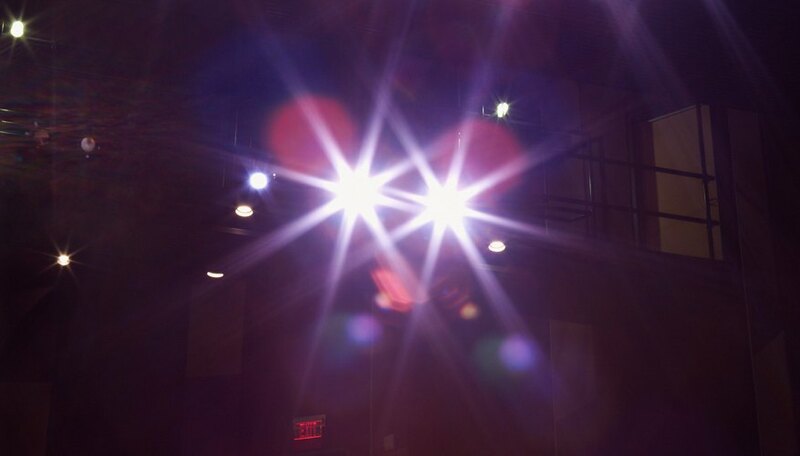 Stage lighting is a critical component of any live performance, whether stage, concert, dance or stand-up that evokes mood and unifies the production. The lighting designer creates the effects and communicates their execution to the technicians with a cue sheet, the script for the lighting sequences. The cue sheet lets the technicians know how and when to produce the effects. It is written after all the lighting has been hung and the technical rehearsal has been completed. Open your spreadsheet and mark six columns with these headings: cue number, act and scene, page number, cue point, description and time. Label the cue numbers under the first column. Start with the number one and continue listing subsequent numbers based on the amount of effects in the performance. Type the act and scene where the lighting effects occur under the heading of the second column, such as Act 1, Scene 1. List the exact page number where the effect appears in the script under the third column. Write a short sentence that gives the signal for the effect in the fourth column. This should be a precise action. For instance, in Act 1, Scene 1 of "Hamlet" the cue for the lighting may occur when the character Bernardo enters. Write a short summary of the lighting effect under the description column. In the above example from "Hamlet," the description may read, "Stage lights come up." Type the length of the lighting effect in the sixth, and final, column. Suppose you want the stage lights to slowly fade in for 30 seconds when Bernardo comes onstage. You would list the duration of the effect in this column. Write your cues in simple language and be as precise as you can. Choose a sans serif font in a larger size for easy reading. Print out extra copies of your cue sheets for the technicians and stage manager. Things sometimes get misplaced during the run of a performance. The Complete Works of William Shakespeare; "Hamlet"
Danette Marie has been writing since 1990. Her work includes promotional materials for both the nonprofit and private sectors in the United States, France and India. She holds a Master of Science degree in communications from the SI Newhouse School of Syracuse University and a Bachelor of Arts degree from Marywood University in Scranton, PA. Danette is based in New York City.